St. Tammany Parish, across Lake Pontchartrain from New Orleans, is one of the highest-growth parishes (counties) in Louisiana. The Poitevent family is the largest landowner in the parish. As it turns out, 1,500 acres of the family holdings are considered by the U.S. 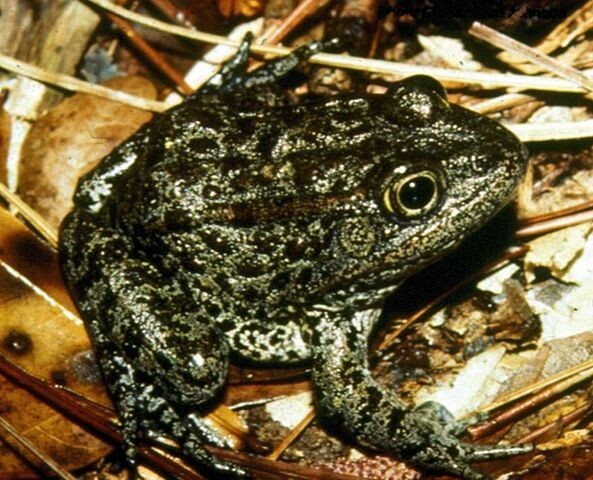 Fish and Wildlife Service to be critical habitat for an endangered species: the dusky gopher frog (Rana sevosa), a/k/a the Mississippi gopher frog, declared endangered in 2001. The Poitevents are suing the feds to prevent their land from being permanently ruled off-limits for development. Today a federal judge allowed the Center for Biological Diversity and the Gulf Restoration Network, two private environmental groups, to join in the suit. Although the frogs no longer live on the land west of Pearl River [which divides St. Tammany from Mississippi], the property is essential for frog recovery because they contain five ephemeral ponds, each within hopping distance of the next, the center said. Dusky gopher frogs lay their eggs only in such temporary ponds — which are free of fish that would devour their eggs. The Poitevents maintain that the longleaf pine tree critical to the frog’s life cycle does not exist on their land. It’s not about common sense. It’s not even about saving the damn frog. This is about Federal bureaucrats, aided by environmental busybodies, stopping at nothing to make sure that private citizens know who’s boss. This entry was posted in Environment, Government, Louisiana. Bookmark the permalink.